Great hide-behind-the-couch keeper, but the chills are diminished slightly on the small screen. On the other hand, at home you can rewind and watch it again, like everyone wants to when they get to that shocker ending. Newer "Vista Series" DVD is THX-certified and includes a feature on the paranormal and a cast interviews conducted a couple years after the film's release. But that's all stuff you watch only once, right? I say stick with the first DVD release, which has a great storyboard comparison with Shyamalan narrating, a fascinating featurette about the importance of music used in the film, & a valuable "Rules & Clues" featurette. You do have to navigate your own way through deleted scenes instead of being able to "play all," but Shyamalan gives great commentary on these outtakes and the reasons they were left on the cutting room floor. Self-congratulatory short about what a hit the film was. Easter egg alert! A scene from "Shyamalan's first horror film" from when he was a kid is on the disc. Find the dead little girl's box. Double feature! Check out our DVD review of Shyamalan's "Unbreakable"
If the line is still too long for "The Blair Witch Project" this weekend, buy a ticket to "The Sixth Sense," the first truly scary studio picture in longer than I can remember and a serious contender against "Blair" for most creepiest movie of the year. Yes, I know it's a Bruce Willis flick, and yes, I know the plot -- about a very disturbed little boy who talks to ghosts -- sounds inane. But this movie stunned me. The hair on the back of my neck stood up five or six times in this picture. The traumatized performance by Haley Joel Osment as the haunted child is the most skilled and chilling turn by a pre-pubescent actor since Kirsten Dunst in "Interview with the Vampire." And Willis, as an emotionally wrecked kiddie shrink, garners more empathy than a truck full of other ex-action heroes could. He plays Dr. Malcolm Crowe, a psychologist whose professional confidence is shattered when a former patient breaks into his home and shoots the doctor in the stomach, then shoots himself in the head. The story takes place several months later as Dr. Crowe begins to recognize the same character traits as the suicide in a small boy named Cole (Osment), who looks so drained, stressed and sleepless that he seems to be carrying a metric ton of emotional baggage in what should be a cheerful, apple-cheeked face. Cole lives every moment with the kind of fear that would make most adults need a change of underwear: Everywhere he goes, he sees the dead wandering the Earth in a state of limbo. But this curse is something he keeps to himself. He knows no one will believe him. Determined to help this boy as a way of redeeming himself for the one he lost, Dr. Crowe -- whose professional life and marriage have nose-dived since witnessing the suicide -- becomes obsessed with getting this boy to confide in him, and it's not until he does that the audience sees what the boy sees. When we do, it sends chills through the theater. Suddenly the world is full of the walking dead -- most of them displaying evidence of horrible deaths -- and they all want something of the boy. Written and directed by M. Night Shyamalan ("Wide Awake"), "The Sixth Sense" is a movie full of deeply shaking psychological shocks and jumps. It has a fair share of cheap scares, but Shyamalan is so sly with them that just a hollow-eyed figure passing through the frame is enough to induce a scream. But this movie rattles you deeper than a mere adrenaline rush. For the first half of the movie, Shyamalan pours tension off the screen like a thick fog with little more than Osment's ripplingly eerie performance. There are other plot points developing at the same time, like the agony Cole's blue-collar mom (Toni Collette) goes through watching her son's mysterious suffering. But it all builds up to the moment when the boy finally opens up to Crowe about the horrifying things he sees. When Osment shudders "They're everywhere...," the goose bumps will march onto your arms like an occupying army. 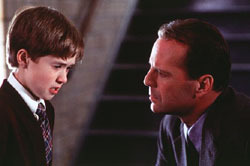 At times "The Sixth Sense" seems to be vexed by small plot holes (Doesn't this doctor have other patients? Who's paying for these house calls?) and troublesome ambiguities, especially when it comes to Willis' character, who never once tries to corner his formerly warm but now distant wife (Olivia Williams) for a marriage-saving heart-to-heart. But have faith. Shyamalan knows what he's doing as he builds towards a stunning resolution that will knock the wind out of every person in the audience. I'd be willing to bet studio suits wanted to dumb down this movie and re-write it with wanton warm fuzzies (a la "Ghost"). But if they did make suggestions, Shyamalan stood his ground. Instead of being ruined by re-writes, "The Sixth Sense" is the kind of film you instantly want to see again to pick up the multitude of details you missed while gripping the arms of your seat (or your date). Bruce Willis, I forgive you for "Armageddon." Brother, you can pick a script.